Time for a book review! For “Merlin’s Nightmare”, book 3 of The Merlin Spiral by Robert Treskillard. The author is running an awesome contest to promote the series, with neat prizes including a kindle and a sword (! ), so be sure to go check out his website! I’ve never had such a case of review-writer’s-block before, because I couldn’t figure out how to express how much I enjoyed this book. Merlin’s Nightmare, book 3 of The Merlin Spiral, takes place about 16 years after the first two books. It follows an older, 30-something year old Merlin, and a now-grown Arthur, who at 18 is full of liveliness and is ready to take on the whole world, seemingly. Together with various other characters, both new ones and re-imagined figures of legend, they must face overwhelming odds and perils from all sides in a desperate fight to save Britain from destruction. Here is the Arthurian legend reborn. I’m not sure how Treskillard managed to make it so original and fresh while simultaneously drawing so many parts of the old King Arthur stories into it so well, but he did. I enjoyed this book SO MUCH. From the very beginning I was completely spellbound – I couldn’t stop reading and finished it in a few days. It was basically everything a book should be: gripping, epic, and just a lot of fun. I kept coming across bits of hilarity and general awesomeness that I would excitedly quote aloud to whatever family member happened to be around. I found myself laughing several times, and the action, adventure, journeying and battles were all awesome. I feel like Merlin’s Nightmare forms the core of Treskillard’s retelling of the Arthurian story. Everything comes together and explodes into this sweeping epic tale, with the first two books providing excellent background so that everything makes sense and you know where it all came from, while also anticipating the continuation of the saga. It was the perfect third book to a trilogy. Anything that bothered me about the first two was swept away because it all makes sense now. I can see the whole. The story arc of Merlin is complete in a way, while at the same time beginning a new one that will focus on Arthur himself. I loved Merlin in this book, seeing his journey through the first two books, into this one, and with a hint toward becoming the Merlin of legend. I can see his faith from the first one, his fighting spirit from the second, and a measure of caution and wisdom brought on by both and the years since, as he continues to struggle toward who he needs to be, before his earthly lord, and his King on high. Arthur is without a doubt the number one thing I loved about the book. He was perfect – both original, and also measuring up to the Arthur of traditional Arthurian legend. All King Arthur figures have a lot to be compared to, and I wasn’t sure if he would be able to compete. I need not have worried. Treskillard’s Arthur was absolutely AWESOME. I loved his boundless energy, his dashing recklessness, his courage and natural leadership qualities, and all-around epicness. He was strong and kingly and downright fun, and overall just stupendous and KING ARTHUR. ❤ I really REALLY liked him and can’t wait to see more of him in later books! In the interests of being balanced, I’m trying to think of any downsides to the book, which is actually difficult. I will say that some of it is a bit scary and/or violent for younger readers, though it didn’t bother me for the most part. It also ended more suddenly than I would have liked, but that’s mainly because I wanted to savor it all and didn’t want it to end. Book 1, Merlin’s Blade, was great. Book 2, Merlin’s Shadow, threw me for a loop because it was so unexpected and different, so I was startled into not enjoying it quite as much, though it was still good. 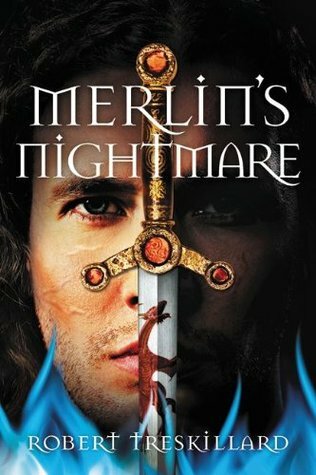 Book 3, Merlin’s Nightmare, simply knocked me over with its awesomeness – as a re-imagining of the Arthurian legend, as its own story, and drawing all the threads from the first two into it to complete the epic tapestry of this story. Read this book, people! If you like Arthurian stories, action/adventure, fantasy, YA, Christian fiction, or just a really good, well-crafted story, or all of that rolled in one. Just read it! I received a free copy of this book from the publisher (Blink YA Books) in return for an honest review. It was in no way required to be positive. These opinions are entirely my own. Do you like Arthurian stories? Do you have a favorite retelling? I need to find out if my library has these… They look great! Ok, to be honest, I don’t think I’d care what the book was …. I just simply love reading your reviews!! They’re always so honest and quirky and just … “you”! 🙂 That being said … this book DOES sound quite good. Guess I should begin with the first one, though, huh?! Good to know you like them so much – thanks for the great review!! Well, no problem … warm glowy feelings are wonderful! But y’know I’m just being honest!! Your adorable personality just shines through your writing … how could it not make me smile?! It may be a while (my TBR list is terrifyingly huge right now …! ), but I most definitely intend to read the Merlin trilogy!